Our charming Cape Cod lodging in Chatham, MA has been designed with our guests’ utmost comfort in mind. 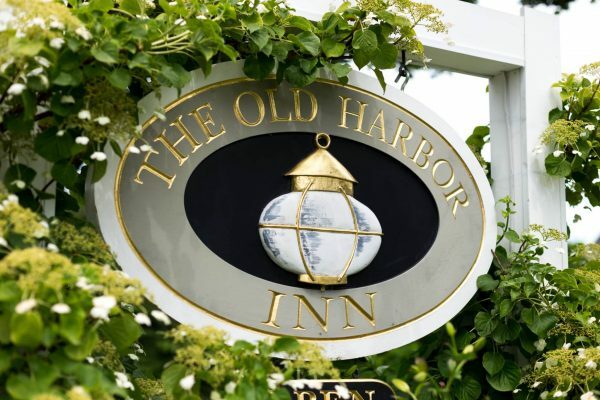 Each room at The Old Harbor Inn is appointed with luxury designer linens and Gilchrist & Soames bath amenities. 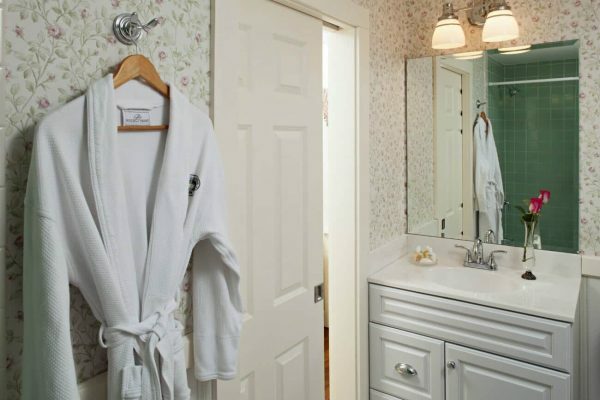 There are small refrigerators, TV/DVD combinations, CD alarm clock radios, hair dryers, air conditioning, bathrobes, complimentary soft drinks and bottled water, and “Welcome snack baskets,” as well as irons and ironing boards in all rooms. 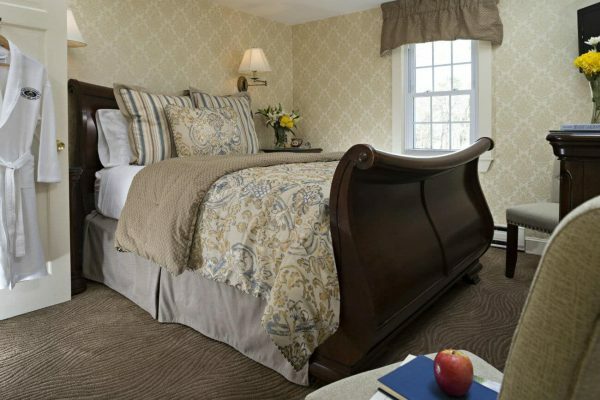 Take a look at our rooms to find the perfect one for your Massachusetts bed and breakfast experience. ROOM SIZE: 380 sq. ft. Perfect for honeymoons and cozy getaways, Stage Harbor is a one-of-a-kind, luxuriously appointed suite, located on the first floor with its own private entrance. 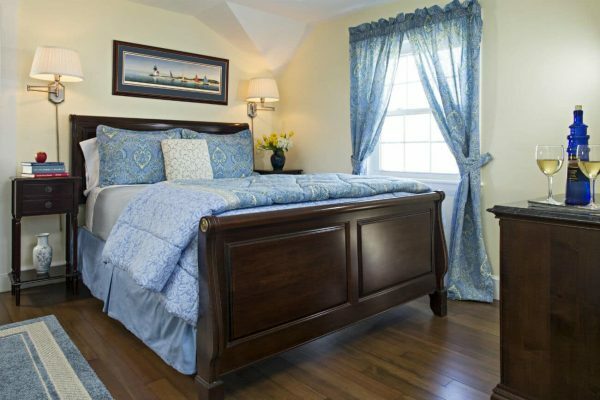 In addition to a king-size platform bed, there is also an inviting day lounge just right for reading or taking an afternoon nap. 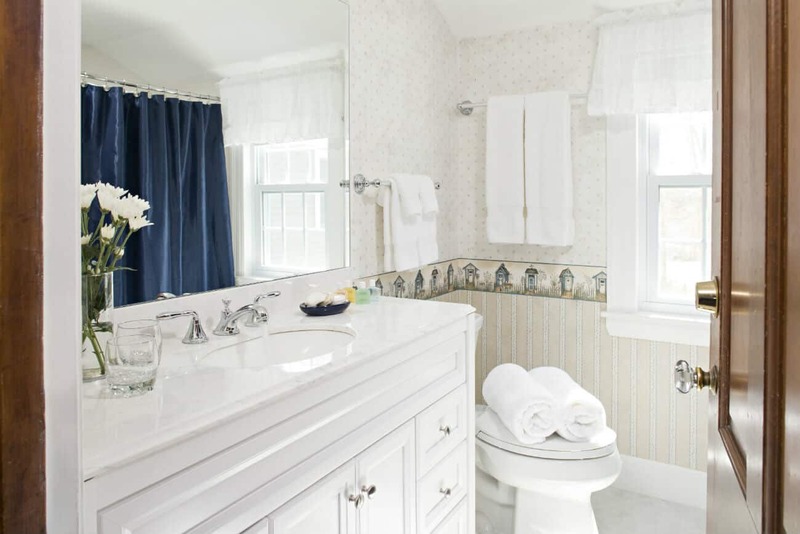 Waverly linens and window treatments in white and blue tones complement the light blue wall-papered room. Comphy Co. sheets complete the bed ensemble. 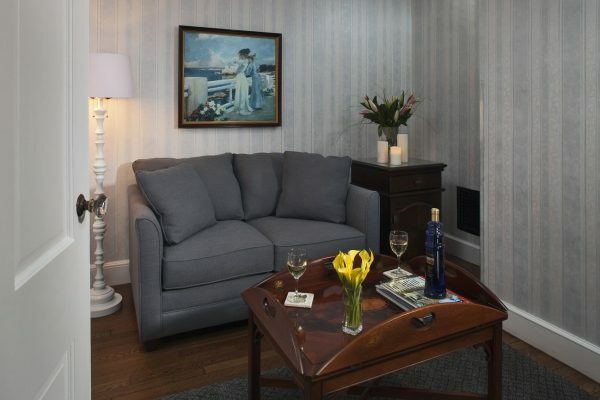 The separate sitting room features a love seat that converts to a comfortable pull-out twin-size bed, enabling the room to accommodate three people (for an extra charge of $75). 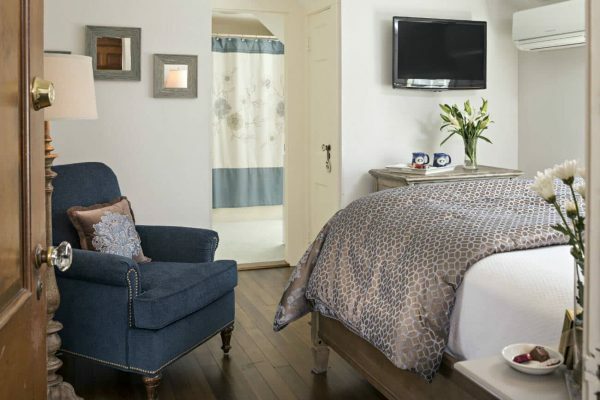 Both the bedroom and sitting room have flat-screen TV/DVD combinations. 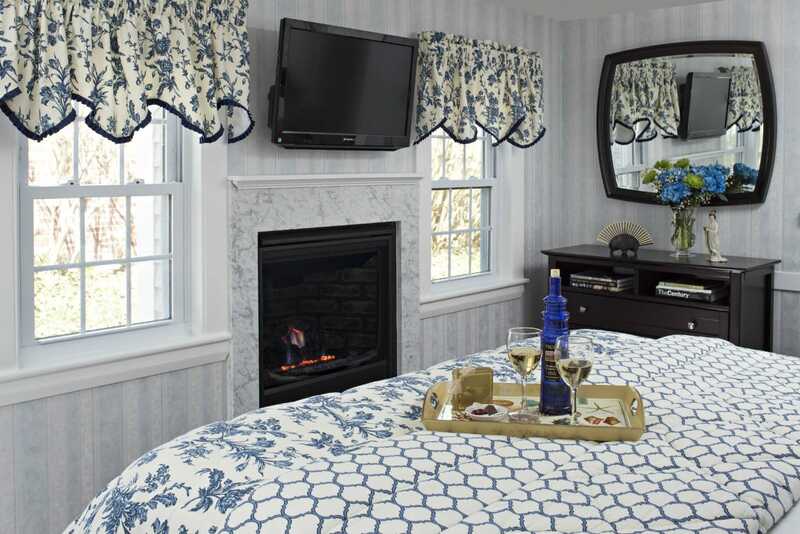 There is a gas log fireplace in the bedroom for cool nights and a mini split AC unit for warmer weather. A ceiling fan creates a gentle breeze for your comfort. The spacious bathroom features a two-person jet tub and step-in shower. 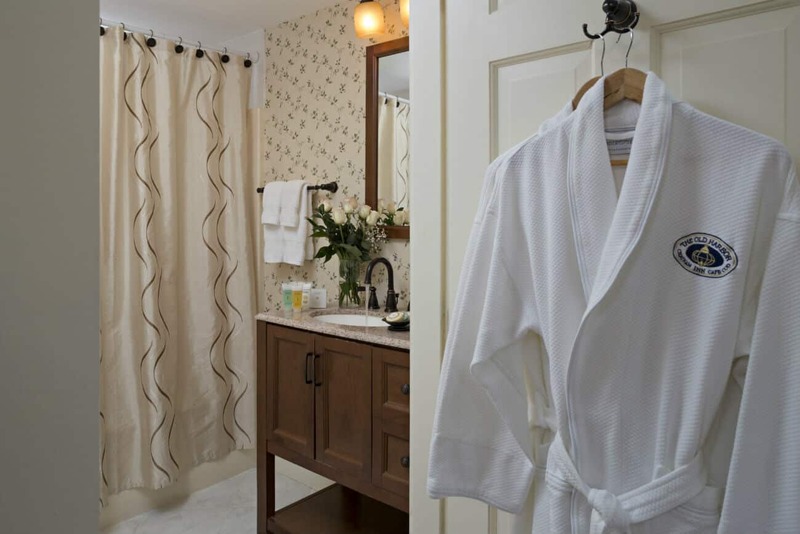 In addition to the above amenities, the room boasts room-darkening cellular black-out shades, bathrobes, hair dryer, small fridge with complimentary soft drinks, bottled water, and a snack basket to make your stay extra special. ROOM SIZE: 356 sq. ft.
Yarmouth is our unique, executive king room. It is located on the second floor, looking out to the east (rear), south (side), and west (front). This room boasts a king-size platform bed with matching bureau in dark walnut that gently curves and lends to the theme of the room. 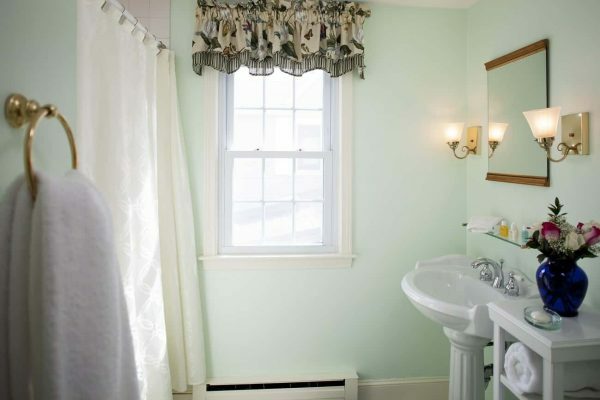 The Yarmouth Room is painted in an aqua hue, with an accent wall papered in a sand shell design that complements the bed linens and valances. 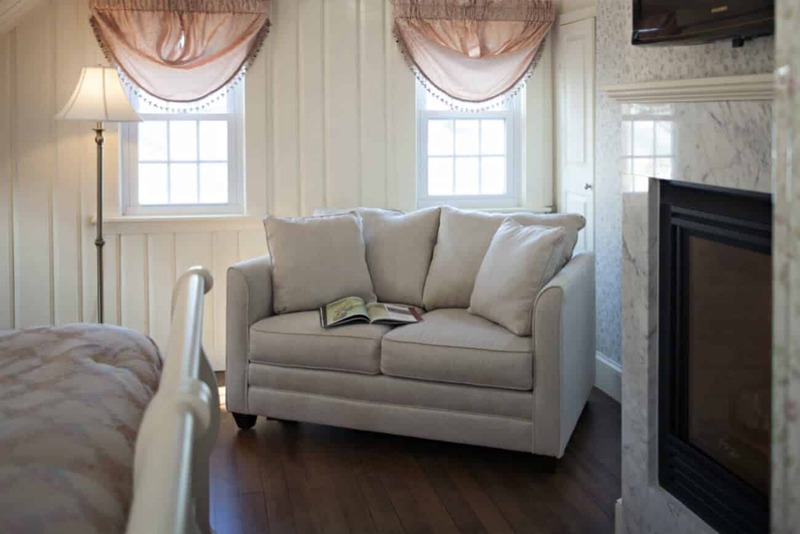 Two cozy reading chairs beckon you to sit and read or watch TV as the gas log fireplace warms you in the winter or the mini split AC unit cools you in the warmer months. Along with beautiful oak floors, this room is made even more splendid with Comphy Co. sheets, a small fridge with complimentary soft drinks, bottled water and snacks, room-darkening cellular black-out shades, and numerous other amenities. 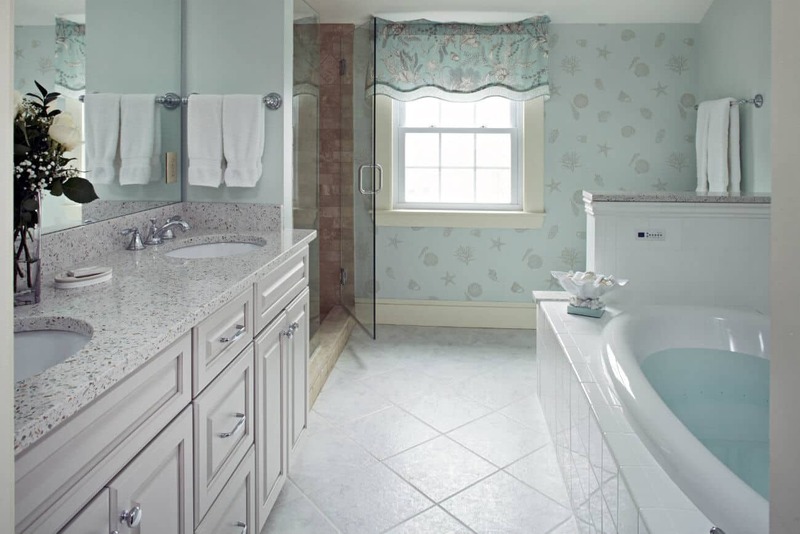 The bathroom has a two-person jet tub (with a TV), a 60-inch double sink, and a step-in tumbled marble shower. 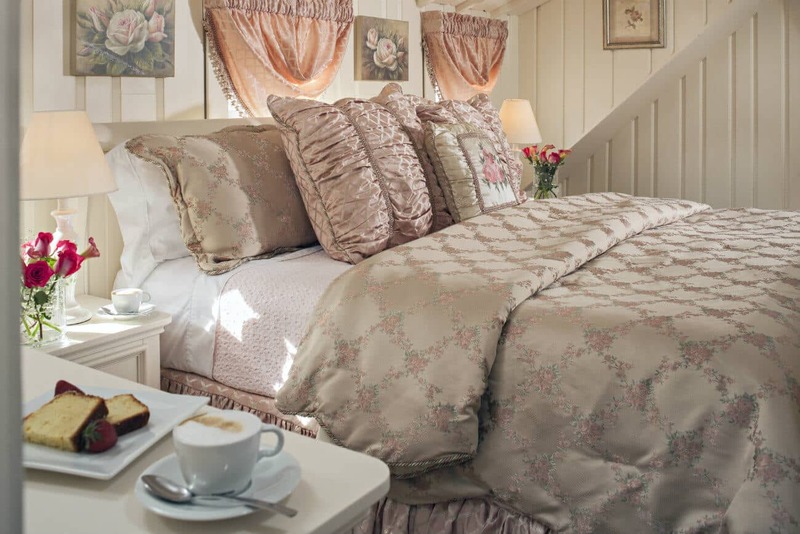 The Yarmouth Room is everything you would expect from a large resort but with the additional comfort and ambiance of a small bed and breakfast – it is no surprise that this is our bestselling room! ROOM SIZE: 295 sq. ft.
North Beach is located on the second floor of The Old Harbor Inn in Chatham, MA. It faces north (side) and east (rear) of the inn. This king-size bedded, cathedral ceiling room is appointed with a luxury comforter and valances from Waterford. 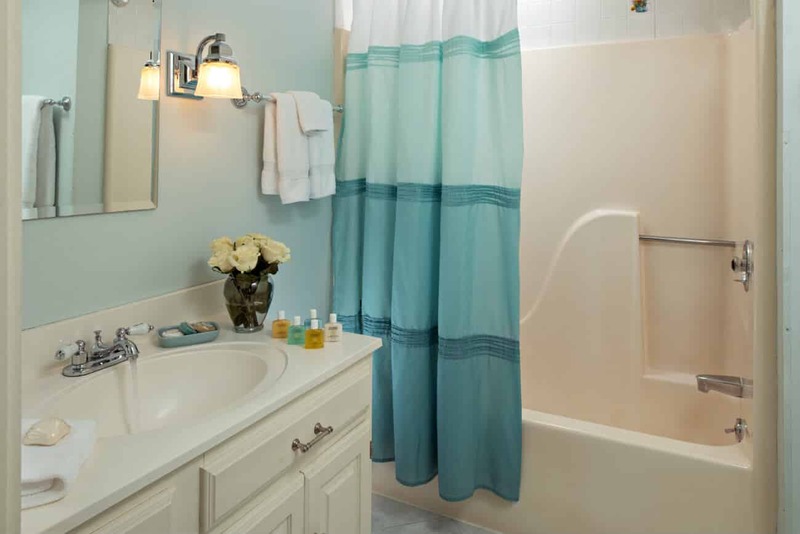 Room-darkening cellular black-out shades glide easily to either let in or keep out light. 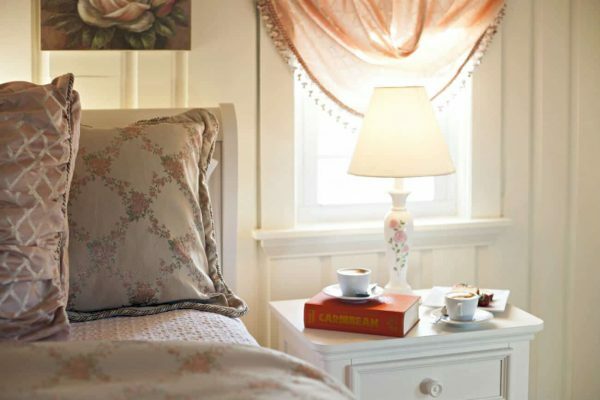 Soft and elegant sheets from Comphy Co. cradle you as you take a quick nap or retire to nightly slumber. North Beach is painted a soft, pale blue with two reading chairs that complement the linens and carpet. 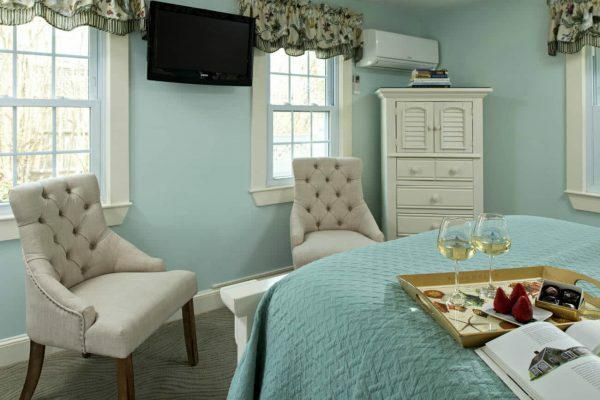 Included in this room are all of our signature amenities as well as a mini split AC/heater, a full private bath, and wine cooler complete with bottled water, soft drinks and snack basket. 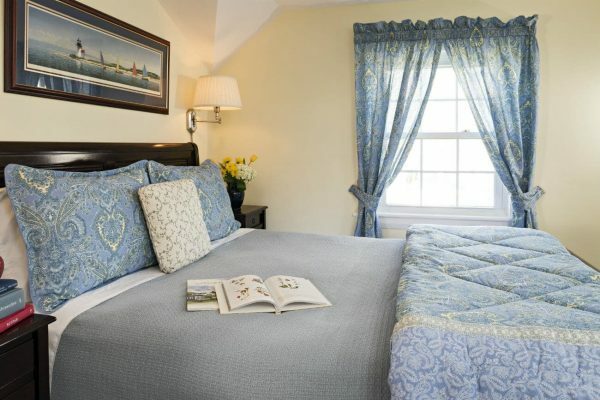 South Beach is one of our luxury second-floor rooms at The Old Harbor Inn. 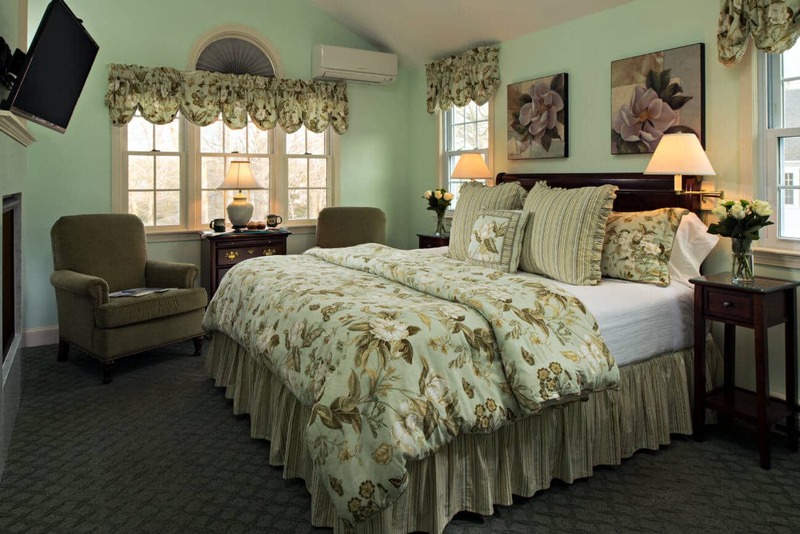 Soft greens invite and help you relax as you enjoy this spacious, cathedral ceiling room. Garden-patterned Waverly linens and Comphy Co. sheets are the perfect accoutrements for this east and south facing room. The king-sized cherry wood sleigh bed has matching bedside tables and a black marble-topped bachelor’s bureau. 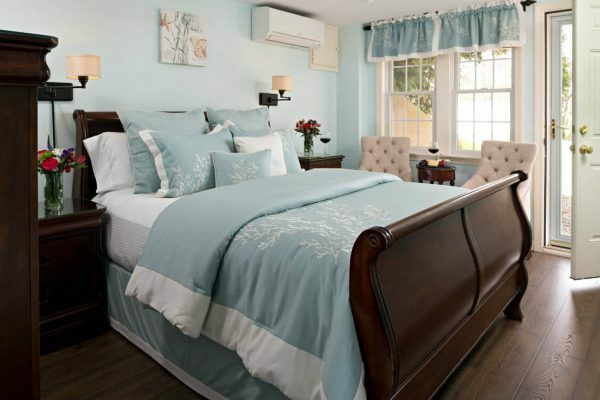 South Beach includes two reading chairs, room-darkening cellular black-out shades, a small fridge stocked with bottled water, soft drinks and snack basket, a full private bath, mini split AC/heater, and many other amenities. 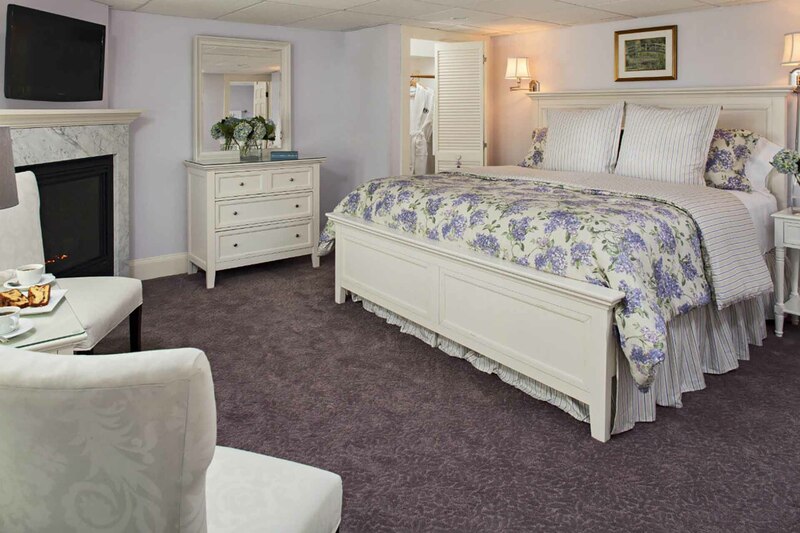 If the color lilac appeals to you, then our newly renovated Oyster Pond Room is calling! 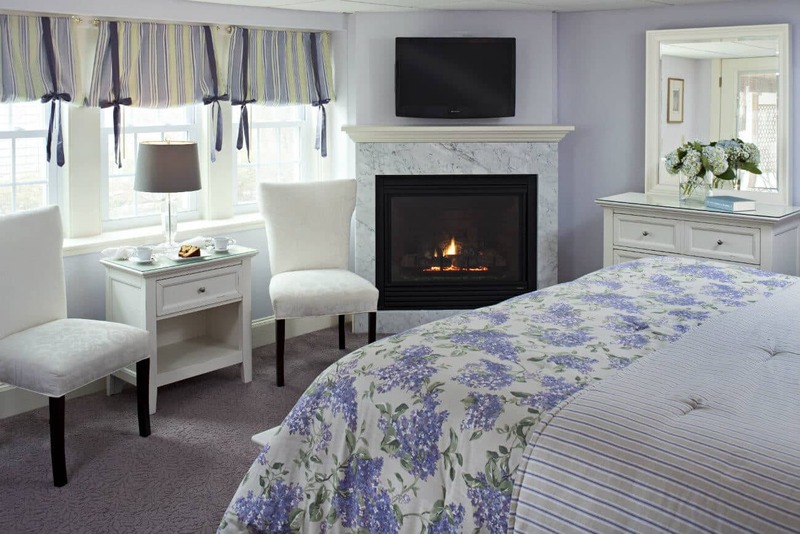 Located on the ground level of The Old Harbor Inn, this room is home to an exquisitely styled king-size bed with Ralph Lauren linens, adorned with lilac flowers to complement the pale lilac painted walls. The bachelor bureau and mirror are a perfect match for the bed. The newly added attached luxury bathroom will delight you with a two-person jet tub, step-in shower, fabulous sink and fixtures, and beautifully tiled floors and walls. 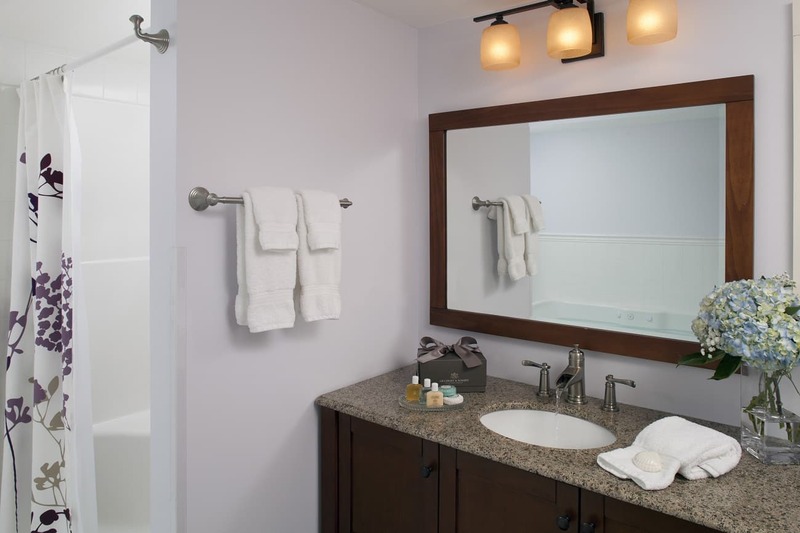 There is even a TV/DVD combination in the bathroom for you to enjoy as you relax in the tub after exploring Downtown Chatham. This room is just divine! ROOM SIZE: 328 sq. ft. 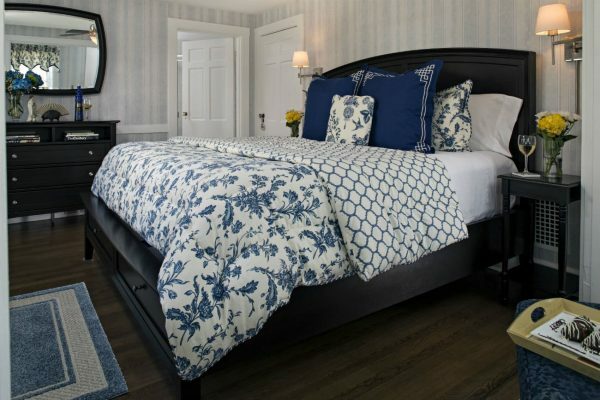 Port Fortune, a superior king room, is the most unique and popular room at our Chatham inn. 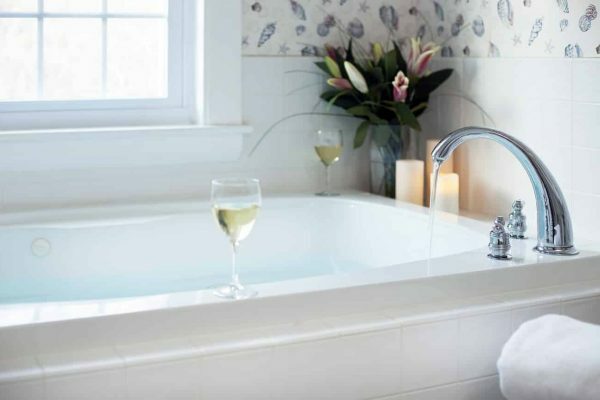 This room makes the perfect honeymoon retreat. Port Fortune is located on the second floor facing west (front) and north (side). As you enter the small hallway that leads to this secluded room, you will feel as though you have stepped into your own private Cape Cod cottage. Slanted ceilings and exposed beams with walls painted in the palest of greens complement the soft pink décor, along with beautifully refinished oak floors. 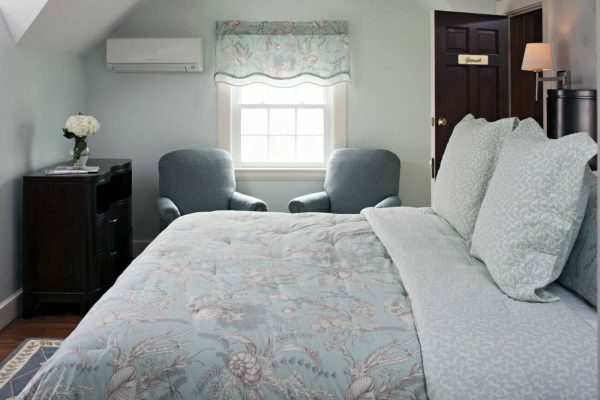 If you are planning a girls’ getaway, this room can accommodate three people (for an extra charge of $75) by converting the loveseat to a comfortable twin-size bed. You will find a small fridge stocked with soft drinks, bottled water, and a snack basket along with Comphy Co. sheets, room-darkening cellular black-out shades, and all of our signature amenities. 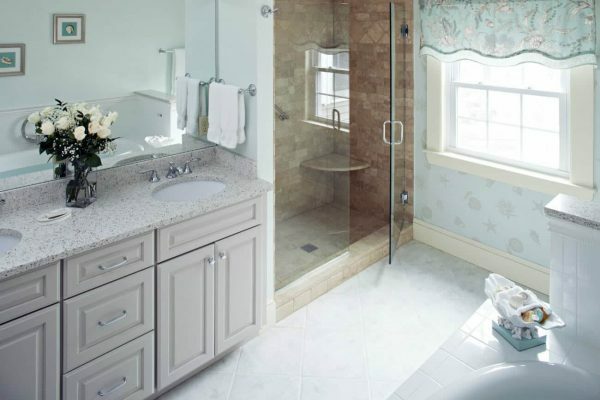 The full private bath is complete with a solar powered, remote control skylight! ROOM SIZE: 244 sq. 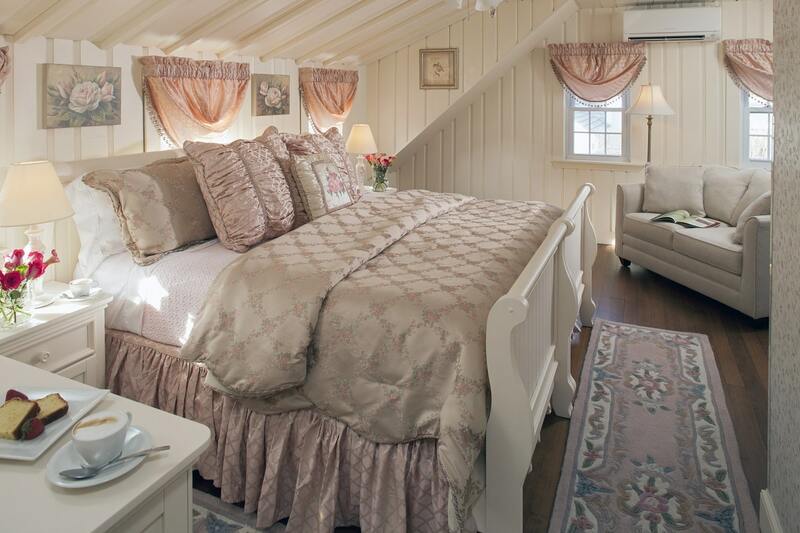 ft.
Eastham is another one of our deluxe queen rooms. It is also located on the first floor and faces north (side) and east (rear) of the property. When you step into this Waverly floral wallpapered room, you will feel like you have arrived in your own garden sanctuary, complete with white cottage furniture. 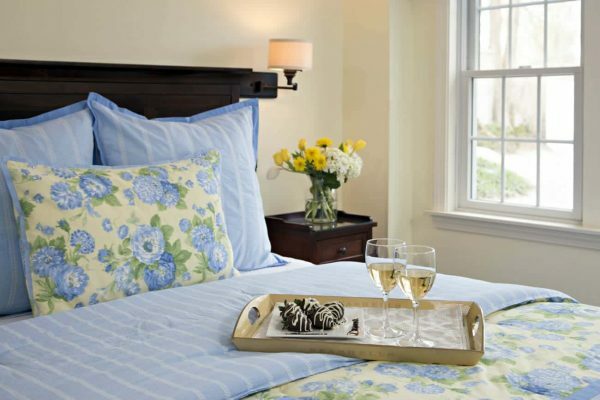 Spend your nights wrapped in Comphy Co. sheets after returning from your Cape Cod adventures. The room includes our standard amenities as well as a full private bath, room-darkening cellular black-out shades, a small fridge with complimentary soft drinks, bottled water, and a snack basket. ROOM SIZE: 261 sq. ft. 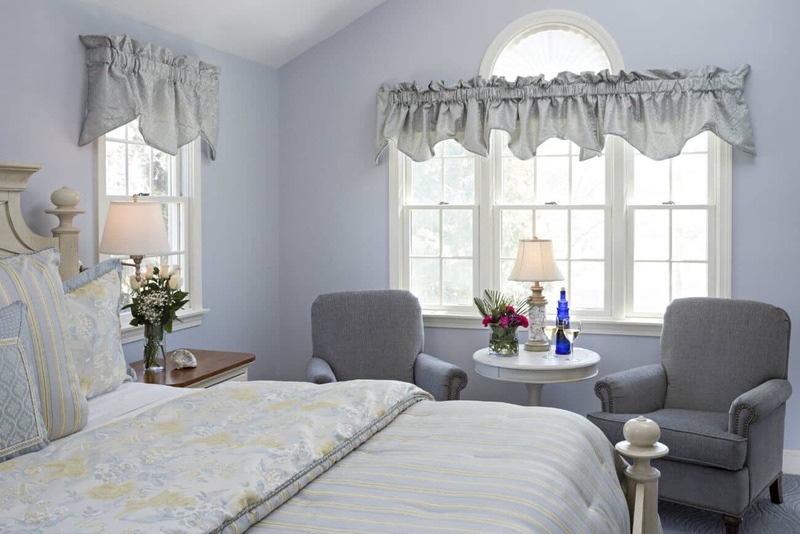 Newly renovated and located on our ground level facing east (rear), Pleasant Bay is a quiet and peaceful room. 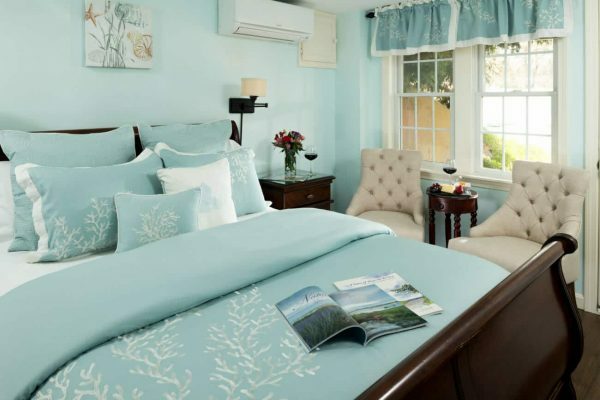 The deluxe cherry queen-size bed is decorated with Laura Ashley linens in a soft aqua hue that complements the two reading chairs in the room. The room offers many amenities, including a ceiling fan, mini split AC and heater, TV/DVD combination, and a small fridge. 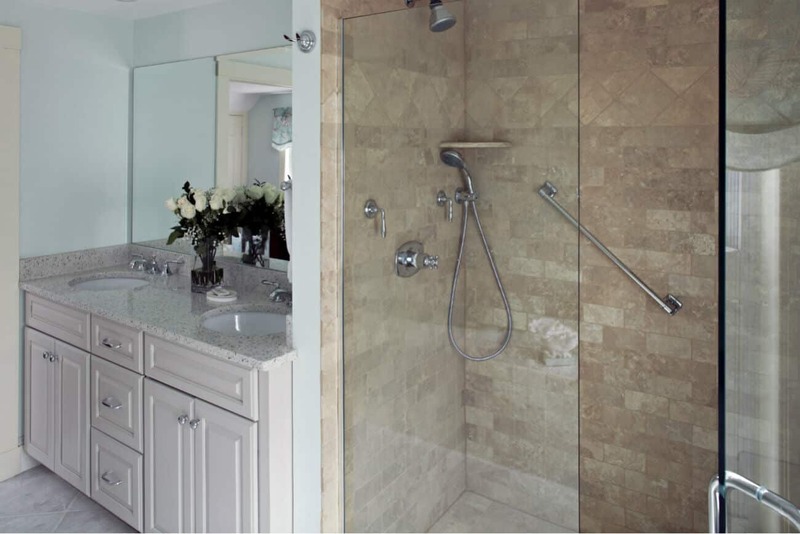 The private bath features a step-in shower. 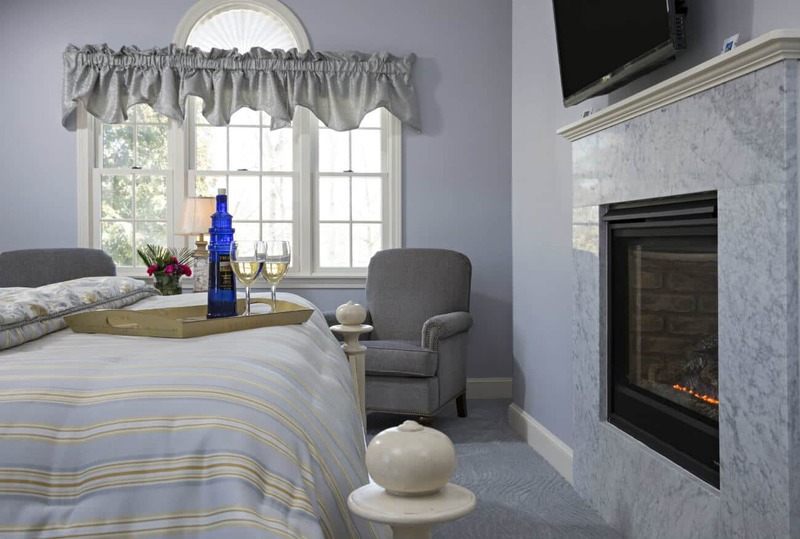 The Pleasant Bay Room is attached to the inn but also has its own private entrance, allowing you to step directly outside from your room. Chatham, a deluxe room, is located on the first floor of the inn. 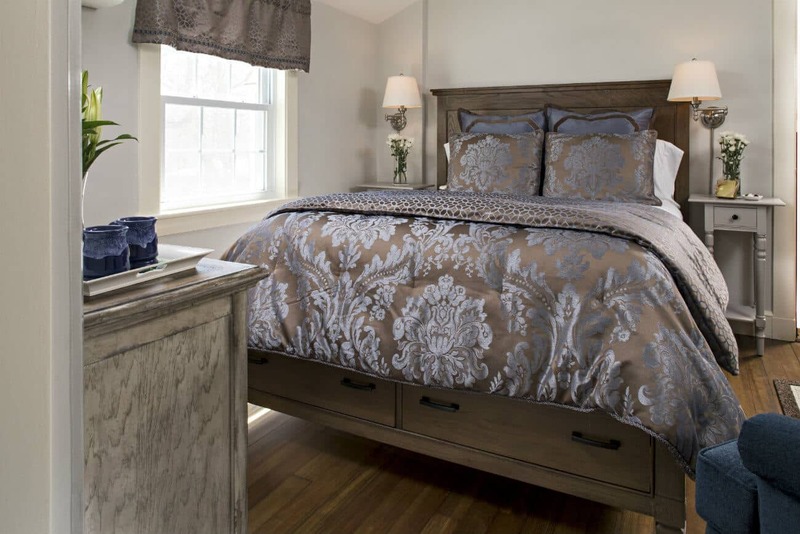 It has a queen-sized cherry wood sleigh bed with matching bureau and bedside table. The beautifully upholstered reading chairs complement the room perfectly. Waterford window treatments and bed linens harmonize with the richness of the room’s wallpaper to make a stunning impression. 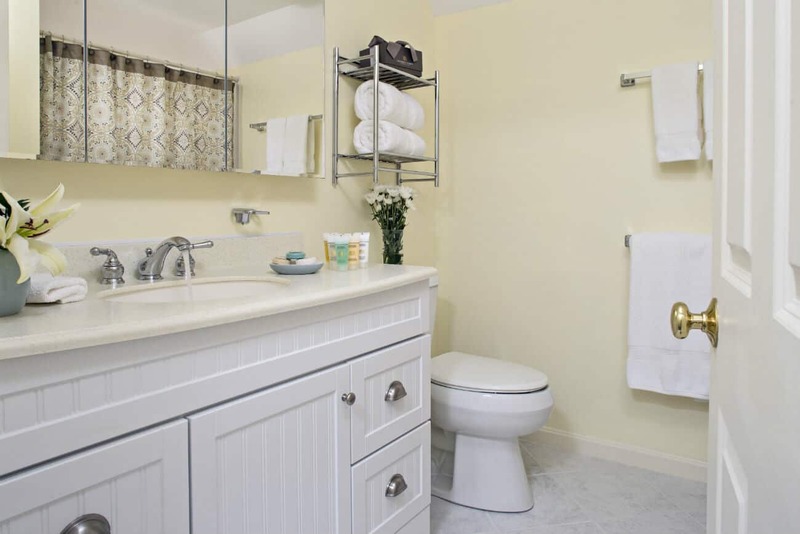 You will also enjoy the luxury of a private bathroom. 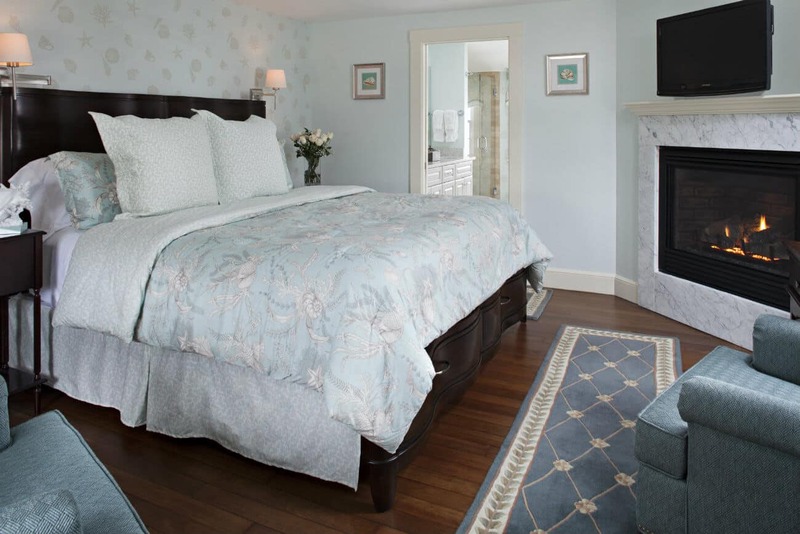 The newly renovated Sutcliff’s Inlet is a deluxe queen-size bedded room, located on the second floor of the inn, facing east (rear). Soft driftwood tones are enhanced by brown and silver blue Waterford linens. The room has a mini split AC and heater as well as a ceiling fan, to keep you comfortable year-round. The full private bath is spacious and features a solar powered skylight. Sutcliff’s Inlet offers many luxuries, including a small refrigerator and a TV/DVD combination to help you relax during your trip to Cape Cod. 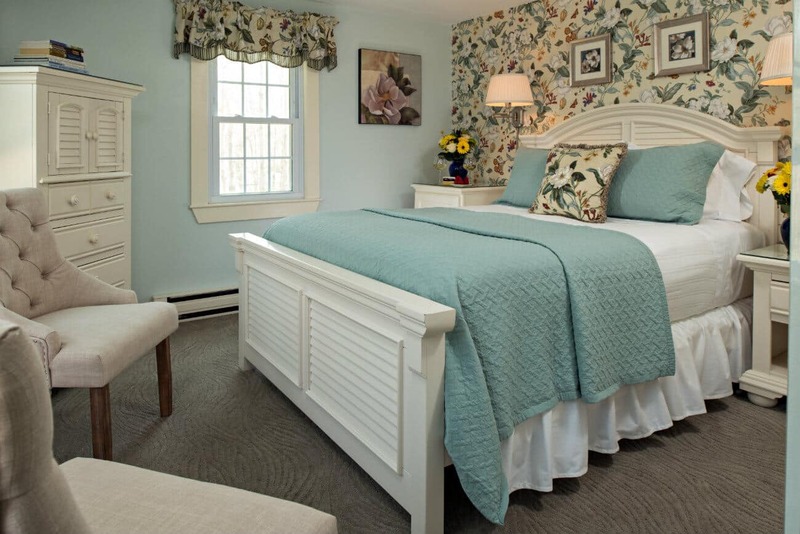 Ryder’s Cove is our standard queen bedroom located on the garden level facing east (rear). 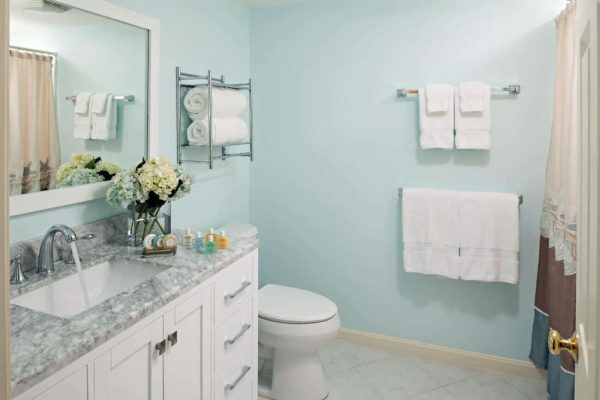 Soft blues welcome you to a peaceful retreat with its own private entrance. 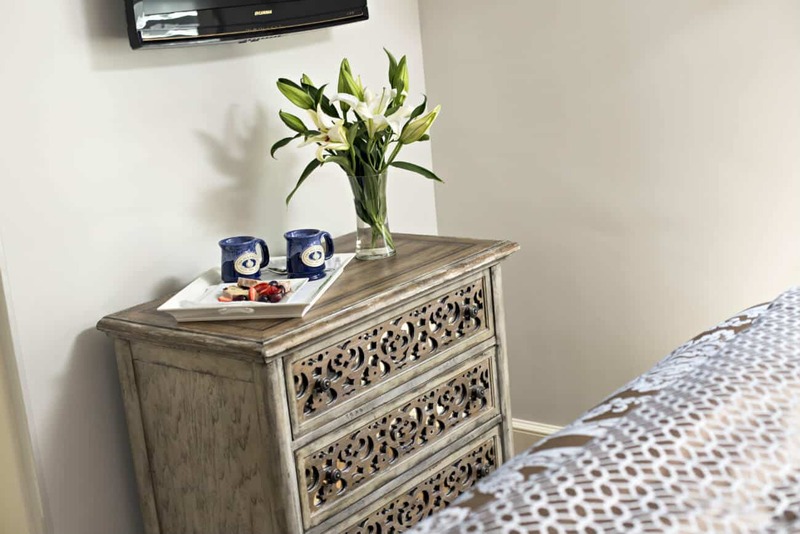 The room offers a TV/DVD combination, ceiling fan, mini split AC and heater, and a small fridge, all to make your stay as comfortable as possible. The private bathroom features a step-in shower. Connected directly to the outside of the inn, Ryder’s Cove gives you both convenience and privacy. ROOM SIZE: 234 sq. 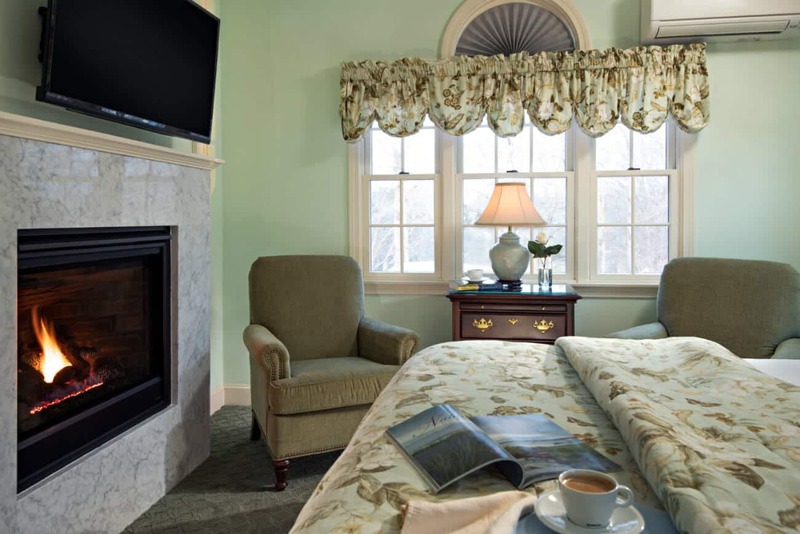 ft.
Monomoy is a charming room located on the second floor, facing the front of the inn and overlooking a portion of our gardens. 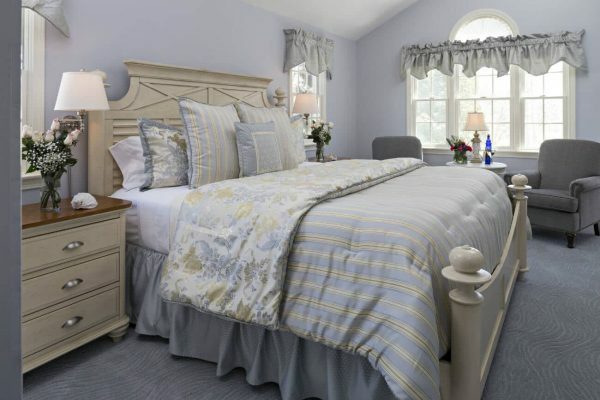 It has been recently renovated to include beautiful refinished hardwood floors, soft yellow walls, and new bedding with Laura Ashley linens and Comphy Co. sheets. Included in the room is a flat-screen TV/DVD combination, room-darkening cellular black-out shades, a small refrigerator supplied with complimentary soft drinks and water, and a snack basket, as well as other standard amenities. 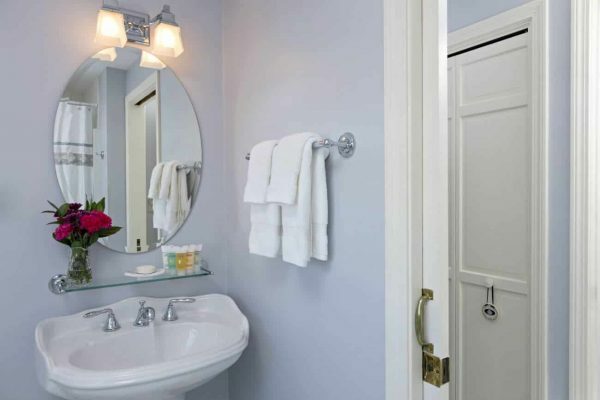 The bathroom for this room is located just six steps down the hall – it is separate but NOT shared, so you will be given your own key. 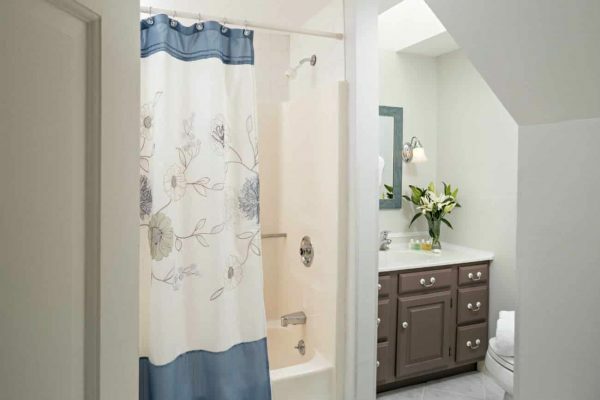 This is a lovely room, just right for the budget-minded guest.